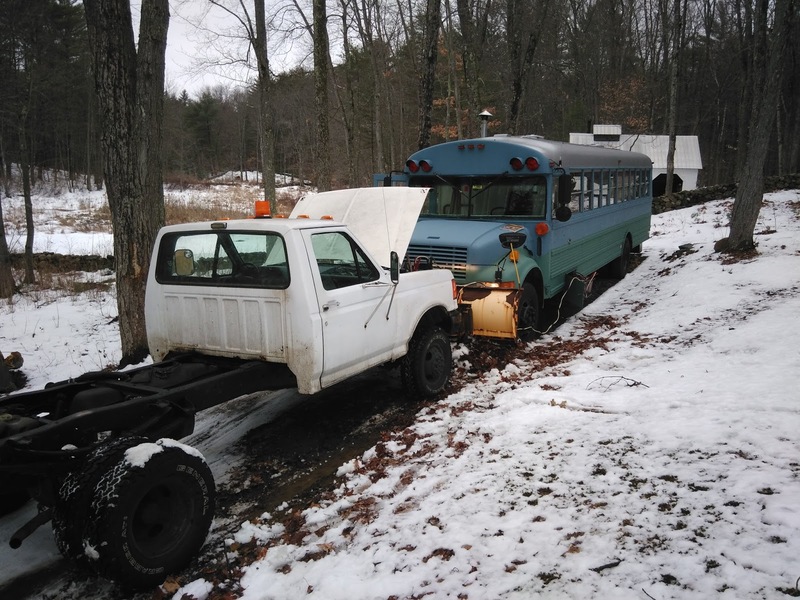 Winter's cold has slowed my pace of construction and tinkering on the bus, and the homestead vehicle collection. 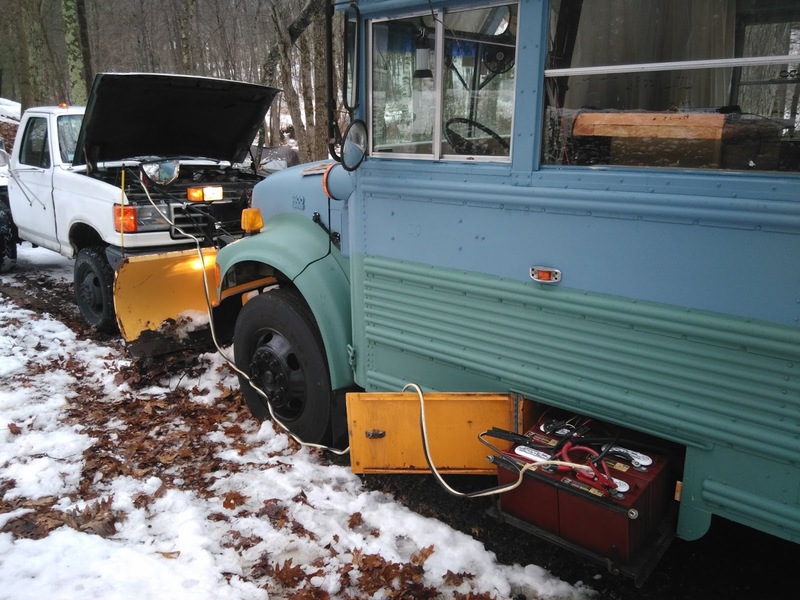 The panels aren't on the bus roof yet. The backhoe still sits in the barn. 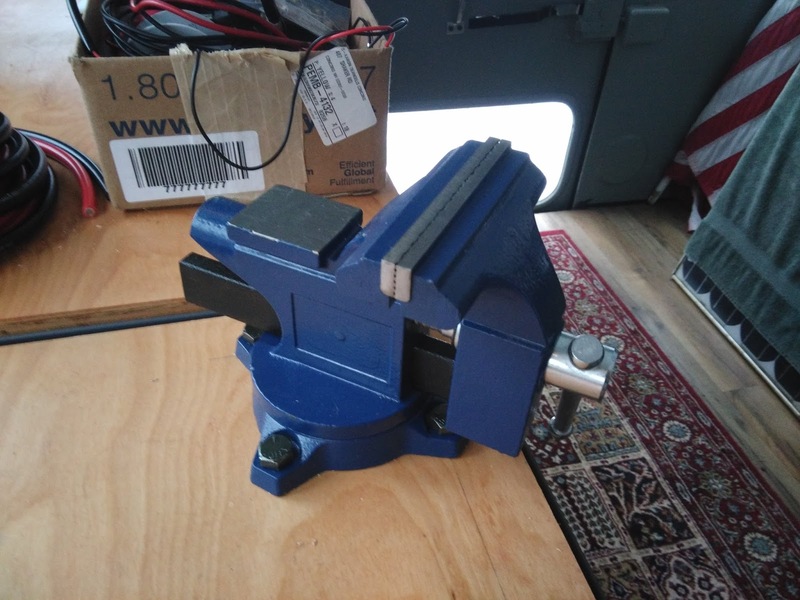 I did, however, install the bench vise that aunt Zowie got me for Christmas. Thanks Zowie! 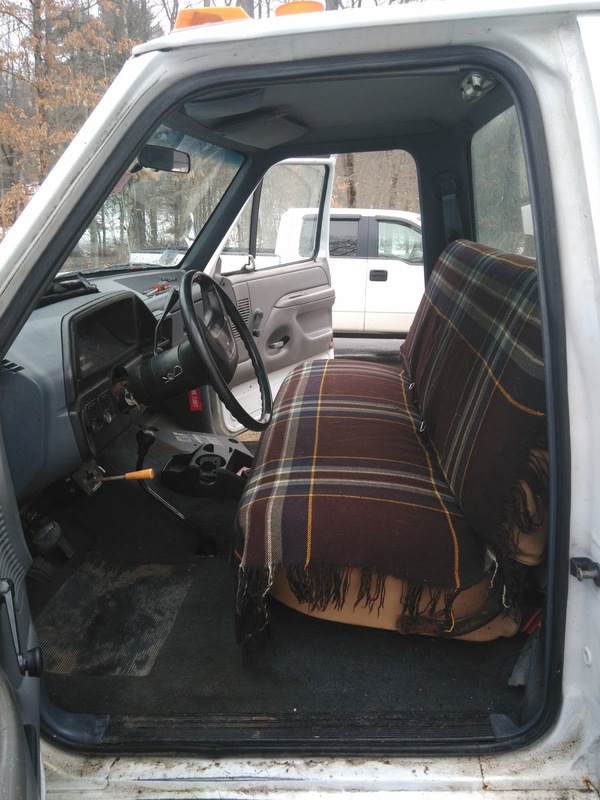 I did put a bench seat in the truck (remember I picked that up in Massachusetts in the last post?) The bucket seats were more than a little gross, and I think the mice were living in them. 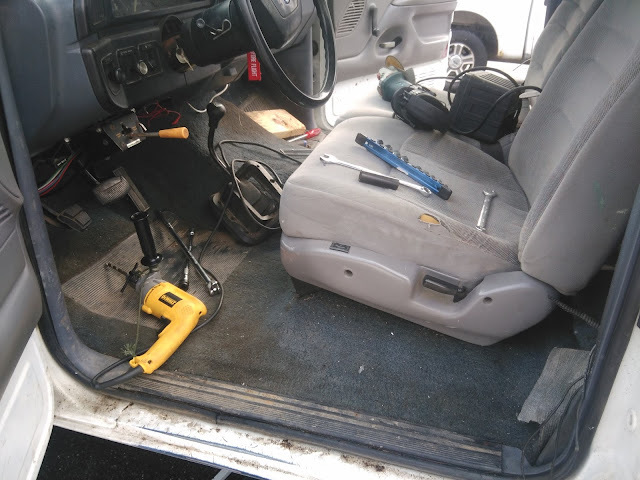 With angle grinder, drill and wrench, I got the carriage bolts out of the cab and pulled the old seats. It was way more fun than you'd imagine. By that I mean it was awkward holding mechanic yoga poses, and my hands were freezing the entire time. I vacuumed the carpet. My mum came over and asked if it was the carpet or the seats that smell like cow manure... good question. This truck has fragrance. 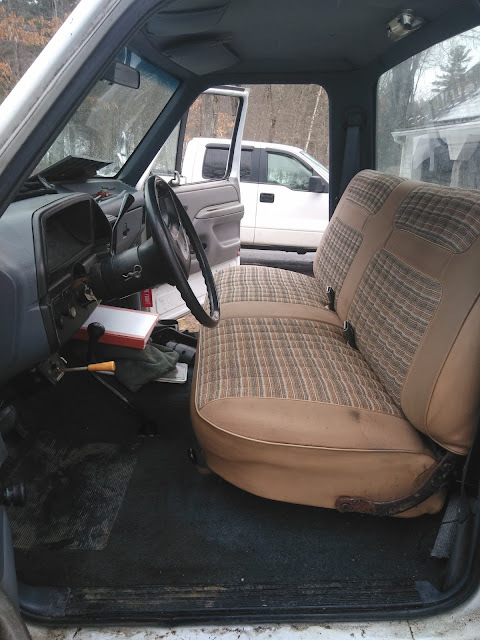 Then the new old bench seat went in ($100 on craigslist, out of a rotten '85 F150.) I dressed it up with a worn-but-classy 1940's blanket I found on Etsy. 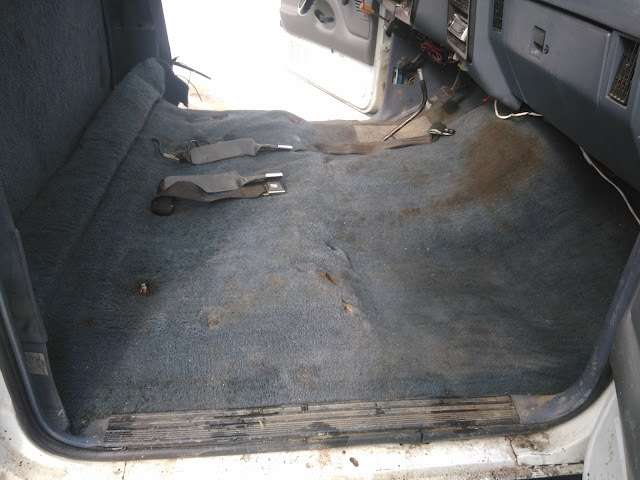 I cut two small slits for the seatbelts to poke through. Etsy is a dangerous place, for the record. You may recall that these batteries once powered the bus. 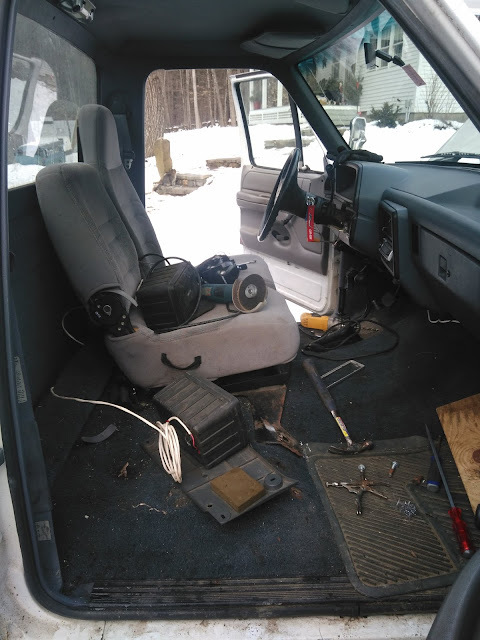 The same day I put the bench seat in I changed the truck's battery terminal lugs over to post-type, ditching the beat up clamp-on style. Without the lead adapter pieces on the battery terminals, the hood closes all the way! Hooray, less fire/electrocution hazards! I don't have any pictures of that job because I was cold. After a full charge, and letting the voltage settle down for an hour, I used the hydrometer to check the bus battery's charge. Each of the individual T105's has 3 cells (a battery cell is ~2 volts.) The battery acid in a fully charged battery has a different specific gravity than that of an uncharged battery. With the hydrometer I found that two of my batteries were scoring in the 85% capacity range, and two were in the 70% range. They need an equalization, but it's going to have to wait until warmer weather and free time comes around simultaneously. I didn't take any pictures because I was working with battery acid... and I was cold. In the meantime, I've been reading... a lot. I read Gaining Ground, by a disciple/contemporary of Joel Salatin's; Forrest Pritchard. After his parents make a profit of $18.16 off several truckloads of corn and soybeans, Forrest returns from college with the mission of saving his family's farm. Very good read with a lot of humor! I also read through the "Wranglestar" family's book, Modern Homesteading. I've been a big fan of Cody's videos on YouTube, and enjoyed this summary of the family's journey that was mostly stitched together by Mrs. Wranglestar. Now I'm onto Everything I Want to do is Illegal, by the illustrious Joel Salatin. I got to see him this weekend, at a National Organic Farmer's of America conference. As the keynote speaker he gave a talk with many of the themes of Folks, This Ain't Normal. He was preaching to the choir, but I enjoyed it very much. The land search continues, and I've elected to set my sights farther North, for various reasons.